Even though the Dow Jones Industrials are at record highs, focusing too much on the next downturn could leave you regretting your reluctance to invest. On Friday, the Dow Jones Industrials (DJINDICES:^DJI) marked its eighth record close of 2014, capping a week in which the Dow jumped more than 200 points. Yet, even though the stock market has helped many investors recover all their losses from the financial crisis and then some, many people have missed out on the most recent gains. Fears of a long-awaited correction for the Dow Jones Industrials have undoubtedly contributed to relatively low stock-ownership rates among the general population, and even experienced investors have been reluctant to commit capital after nearly three years without a 10% drop for the Dow. Yet, if you always wait for a Dow correction to invest, either in the whole Dow or in component stocks like Boeing (NYSE:BA) and Disney (NYSE:DIS), then you might well find yourself investing at higher levels than you would have if you'd simply gone ahead and bought shares at regular intervals along the way. Dow Jones Industrials data by YCharts. It's extremely unusual for the Dow to go this long without what most investors consider to be an official correction. Typically, the Dow takes a much bumpier course in its general trend higher, with 10% corrections coming roughly once every year. If the Dow can hold onto its gains until September, it will mark the third anniversary of the end of the last correction of that magnitude. Given just how long this bullish run has lasted, it's no surprise that some nervous investors have been holding back on buying stocks for a long time now. In particular, since the Dow started hitting new all-time record highs more than a year ago, many investors have tried to time the market by waiting for a correction. In the process, though, these Dow investors have left themselves in a bind. With the Dow at 14,000 just more than a year ago, these investors looked to buy at 12,600 or less. Yet now, even if they get the 10% drop from current levels that they're hoping for, it'll only bring the Dow down to 15,200 -- more than 20% above their target price, and nearly 10% higher than they'd have paid if they had just bought into the stock market at that time. For certain individual Dow components, the wait has been even more costly. Boeing has risen at a 40% annual clip during the past two years, with a major correction coming only earlier this year at prices well above where Boeing stock traded at the beginning of 2013. Boeing has overcome huge concerns about its 787 Dreamliner aircraft and its ability to overcome initial problems, but expecting a correction would have left you out of the stock for some of its most promising growth years. Similarly, Disney has climbed higher, gaining 35% to 40% since mid-2012, with even fewer hiccups along the way. Success in its growing stable of movie franchises has spread throughout the entertainment giant's operations, and Disney has kept working hard to solidify its leadership of the industry. The company's consistent growth has made pullbacks few and far between, leaving many would-be shareholders on the sidelines. 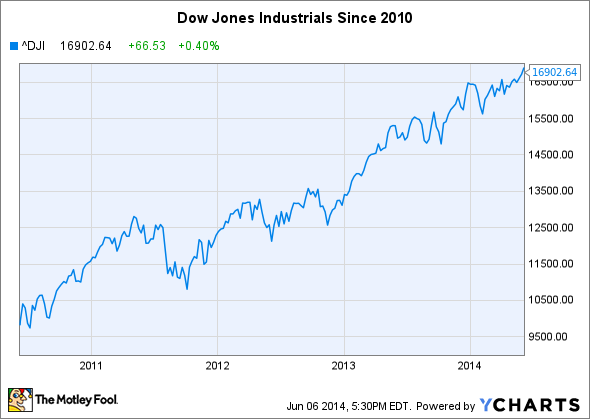 There's no question that a Dow correction will come at some point. But unless you have a huge lump sum to invest right now, you shouldn't let fear of a correction keep you from starting a regular investing plan. By investing a bit at a time, you might buy a few shares at the top of the market, but you'll also prevent yourself from missing out on future moves higher for the Dow Jones Industrials, and stocks like Boeing and Disney.